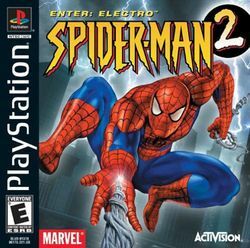 Spider-Man 2: Enter Electro is the second PlayStation game to feature Spider-Man, and also serves as the sequel to the 2000 video game Spider-Man. This game follows Spider-man as he attempts to stop his old enemy Electro from obtaining a source of power called the Bio-Nexus Device. Game bosses included Hammerhead, Lizard, Sandman, Shocker and the exclusive charged-up Hyper-Electro. This page was last edited on 26 October 2015, at 04:32.